Hieroglyphics is an underground hip hop collective based out of Oakland California. It was founded in 1991 by rapper Del the Funky Homosapien. The collective consists of Del The Funky Homosapien, Casual, Pep Love, Domino, DJ Toure, and all four members of the rap. It was created by Del the Funky Homosapien and is based on the Mayan numeral for 8, also used as a symbol for infinity. He said the logo slowly became more and more popular, as it’s been referred to in other forms of pop culture such as “The Walking Dead” TV show. Hieroglyphics’ music is typically composed of funky or jazzy beats with old school deliveries and lyrics. As a collective, Hieroglyphics has released three studio albums, including “3rd Eye Vision” (1998), “Full Circle” (2003) and “The Kitchen” (2013). “3rd Eye Vision” is Hieroglyphics’ first album as a collective. Its beats are funky, and their delivery is a straightforward expression of substantial poetry and lyrics. The song “All Things” perhaps exemplifies this the most. The sound is reminiscent of 1970s funk and soul with lyrics that encourage the listener to question the society that surrounds them. The song “Miles to the Sun” explains that Hieroglyphics has more flows than the number of miles to the sun. In the song “Mics of the Roundtable” Hieroglyphics compares their quest to be the greatest rap group to the knights of the roundtable and their quest for the Holy Grail. 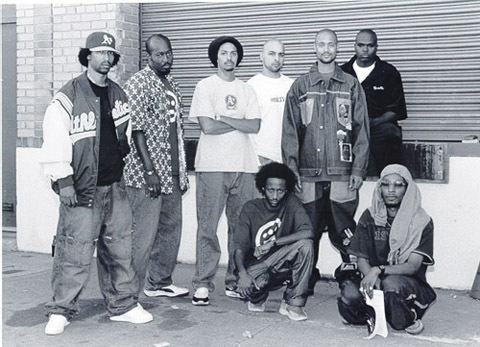 “Full Circle” is Hieroglyphics’ second alum as a collective. This album shifted to a chiller vibe, as opposed to the funkier beats of the previous album. It utilized a female chorus in a few of the songs. “Make Your Move” is one of my favorite Hieroglyphics raps. It emphasizes a guitar-oriented beat and utilizes the vocal talents of neo-soul artist Goapele for the chorus. The lyrics show snapshots of three different characters’ lives. One seeks to turn over a new leaf, one is living a fun and carefree life and one seeks entrance into the drug trade, as his 9-to-5 job doesn’t earn him enough money. “Maggie May” is a song about a former roommate that fell onto hard times and made poor decisions with her life. “Full Circle” (the song) has a chill sound and lyrics that talk about taking on the world. Once again Goapele provides great vocals. “The Kitchen” is Hieroglyphics’ most recent album. It has a much more modern and different sound, but tries to incorporate a classic delivery of lyrics. The Song “It’s Partly Me” has a beat that samples 60s R&B and the lyrics revolve around a man who questions whether his current relationship is working out. The song “Wshores Galore” has a steady beat with lyrics that talk about some of the group’s adventures while on tour. Hieroglyphics provided a different west coast sound which differed from the dominating G-Funk sound from the region. Their jazzy and funky beats, combined with a straightforward delivery mixes together to make music that sounds great.